What’s the Big Deal with CIO? 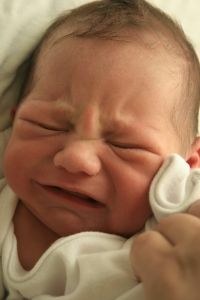 Among parents of infants these days, there is constant debate about how to respond to a baby’s cries. On one hand, there are proponents of the “cry it out” method, where the baby is left alone to cry in the hopes that he or she will eventually stop. On the other hand, there are the attachment parents who respond immediately to their crying babies and attempt to soothe them using various methods including holding and cuddling. While the cry-it-out (CIO) method has been popular in previous years, Attachment Parenting (AP) is gaining a foothold among new parents today. Results of studies in psychology indicate the AP approach to crying is most likely to result in an emotionally and physically healthy child. Attachment Theory originated in the late 1960s, when psychologist John Bowlby postulated that a warm, intimate relationship between caregiver and infant is necessary for optimal health as well as for basic survival. As such, each individual is born well-equipped with reflexes and instincts for interacting with a primary caregiver, which is often the mother. For example, infants quickly learn to recognize and prefer both their mother’s voice and smell. As babies develop some locomotor control, they display their desire to be close to their caregivers by reaching toward their mother or father to be picked up or by crawling toward them. From an evolutionary perspective, these behaviors have survival value. Babies who lack such attachment behaviors will stray from their caregivers and are more likely to get lost, attacked, and perish. An infant’s cry is also intended to increase the likelihood of its survival, as a mother’s instinct is usually to go to her child at the first sign of distress. Protest consists of loud crying and extreme restlessness. Despair consists of monotonous crying, inactivity, and steady withdrawal. Detachment consists of a renewed interest in surroundings, albeit a remote, distant kind of interest. Thus, it appears that while leaving babies to cry it out can lead to the eventual dissipation of those cries, it also appears that this occurs due to the gradual development of apathy in the child. The child stops crying because she learns that she can no longer hope for the caregiver to provide comfort, not because her distress has been alleviated. Do babies cry more when they are attended to? A 1986 study concluded just the opposite: The more a mother holds and carries her baby, the less the baby will cry and fuss. Cross-cultural studies also show that parents in non-Western societies are quicker than parents in Western societies to respond to their crying babies, and babies in non-Western societies cry for shorter spans of time. Caregivers in 78% of the world’s cultures respond quickly to an infant’s cries. For instance, Efe caregivers in Africa respond to a baby’s cries within ten seconds at least 85% of the time when the baby is between three and seven weeks old, and 75% of the time when the baby is 17 weeks old. !Kung caregivers respond within ten seconds more than 90% of the time during the baby’s first three months, and more than 80% of the time at one year old. In contrast, American and Dutch caregivers have been found to be deliberately unresponsive to an infant’s cries almost 50% of the time during the baby’s first three months. Infants in non-Western societies have been found to fuss just as frequently as those in Western societies, but due to the prompt response of caregivers in non-Western societies, the overall cumulative duration of crying is less than what occurs in Western societies. According to Attachment Theory, many babies are born without the ability to self-regulate emotions — that is, they find the world to be confusing and disorganized, and do not have the coping abilities required to soothe themselves. Thus, during times of distress, they seek out their caregivers because the physical closeness of the caregiver helps to soothe the infant and to re-establish equilibrium. When the caregiver is consistently responsive and sensitive, the child gradually learns and believes that she is worthy of love and that other people can be trusted to provide it. She learns that the caregiver is a secure base from which she can explore the world, and if she encounters adversity, she can return to her base for support and comfort. This trust in the caregiver results in what is known as a secure individual. Children who do not have consistently responsive and sensitive caregivers often develop into insecure individuals, characterized by anxious, avoidant, and/or ambivalent interactions. Long-term studies have shown that secure individuals, compared to insecure individuals, are more likely to be outgoing, popular, well-adjusted, compassionate, and altruistic. As adults, secure individuals tend to be comfortable depending on others, readily develop close attachments, and trust their partners. Insecure individuals, on the other hand, tend to be unsettled in their relationships, displaying anxiety (manifesting as possessiveness, jealousy, and clinginess) or avoidance (manifesting as mistrust and a reluctance to depend on others). North American parenting practices, including CIO, are often influenced by fears that children will grow up too dependent. However, an abundance of research shows that regular physical contact, reassurance, and prompt responses to distress in infancy and childhood results in secure and confident adults who are better able to form functional relationships. The study’s researchers suggested that caregivers should answer infant cries swiftly, consistently, and comprehensively — recommendations that are in line with AP principles. CIO supporters tend to view their infants’ cries as attempts to manipulate caregivers into providing more attention. Holding this view can be detrimental to the immediate and long-term health of the baby. In the field of cognitive psychology, there exists the premise that our thoughts underlie our behavior. Thus, if we think positively about an individual, our behaviors toward them tend to be positive as well. Conversely, if we think negatively about an individual, we will behave correspondingly. Consider people in your own life whom you consider manipulative — how does that perception influence your behavior toward them? It is unlikely that the interpretation of a manipulative personality will result in the compassionate, empathetic, and loving care of that individual. Infants, quite helpless without the aid of their caregivers, may suffer both emotional and physical consequences of this type of attitude. When faced with a crying baby, it may be prudent to ask yourself the following questions: Why am I choosing this response? Do I want my baby to stop crying because he feels comforted and safe, or do I want my baby to stop crying for the sake of stopping crying? What is my baby learning about me and the world when I respond in this manner? If I was a baby and was upset, how would I want my caregivers to respond? Reprinted with permission from http://drbenkim.com. This was great, well argued and interesting to read, but I found the lack of references a bit unfortunate, as someone who practices CIO might not be convinced by an article against CIO on an AP website! This is the absolute best article I have read in a long time. THANK YOU! This is NOT the purpose of CIO. Leaving a child at any age to “cry until they eventually stop” is destructive parenting. True CIO involves encouraging the child to soothe on their own, and SHOULD NOT be done when babies cannot sleep through the night. Misinformation like this gives parents who use CIO a bad name. Please get your information straight BEFORE propagating crap like this. Thank you for a wonderful article encouraging all to exercise compassion for our babies. I would never expect an adult who is distressed to tough it out alone. Imagine, you become sad for some reason, begin to cry, then your partner all of a sudden starts ignoring you, leaves the room and either disappears or keeps returning only to leave again. It certainly wouldn’t feel very supportive or caring from someone you trust. As a new mother of a 6 month old boy, i definitely feel a visceral and emotional need to respond when he cries. I am not interested in CIO however, i am concerned that in my AP style, i may not be “teaching” my son how to fall back to sleep once he awakes after a sleep cycle of about 45 minutes. If i understand CIO correctly, the proponents believe that they are teaching the baby that its ok to fall asleep on their own. even typing this, i see how illogical it is to ask a baby to “learn” how to sleep by crying, but i am so confused on what to do…. how do i help him to sleep more than 1 hour at a time? Or as an AP mother, is it my role to comfort him every hour from 7pm to 6am? I am sad to admit that my patience is severely tested throughout the night and while i want to remain comforting, i tend to become very frustrated and angry with both of us, his not sleeping and my “not being good enough” by 8am. I really like this article but I would like to see the references as this would give more credibility to the statements. CIO believers would have more information if the references were published. I think you missed the point of the article’s criticism of CIO,which is that children are not born with the ability to sooth themselves. They simply do not have the neurological or cognitive capabilities, and do not start developing these abilities until 18-24 months of age. This is empirically supported by the majority of current research in developmental psychology. The research indicates that allowing an infant to CIO under the assumption that doing so teaches them to self-sooth is not only based on erroneous assumptions about the child’s abilities, but is also potentially damaging to the child’s long term mental and physical well-being. Please note that this is not a judgment statement, but one based on research. Parents who allow their children to CIO because they believe it is of benefit to the child are not bad parents… they are just ill-informed parents. If your mothering instincts and the statistics don’t get you, that very last sentence is enough reason for me. That golden rule is how I approach my child in most situations. We tried AP when my daughter was born till a month and a half. It was horrible. My daughter wasn’t sleeping well, she was snacking all day, and I wasn’t able to anything to take care of our home as a wife/homemaker. We decided to give the babywise method a chance and it’s been like night and day. Now at 4 months she has a great day time routine that includes eating, playing, and napping and sleeps a total of 10 hrs at night. I’m just saying, don’t criticize until you have first hand experience. Because we let our son cry himself to sleep in our arms, Is this NOT attachment parenting anymore? My soon 10 month old only has ever slep in our bed, and was always nursed to sleep, day and night by me as i have a long maternity leave and enjoyed it. For the past 2 months he wakes around 5 times a night, 2 for feedings and then e rest just use my brbeast as a pacifier. He cant get back to sleep without it. Now after much debate my husband and i decided to try to stop the ‘pacifier’ part of night feeds and resorted to us carrying him to sleep. Even if it was 45 mins of carrying. He cries for abput 30 mins ( its the first two days).I carry him alot since he was born and take naps with him most times too. We love him and just need some comments from parents who might have better advice for us. Because we let him cry himself to sleep in our arms, Is this NOT attachment parenting anymore? I would like to hear about the subtle medium options between CIO and attachment. Well then, Liz, please tell us: what is the purpose of CIO? Because the articles and books I’ve read by CIO proponents are very clear that CIO is to be used to sleep-train babies who don’t yet STTN. I have to agree with Liz here… the child is NOT left to CIO alone. There are VERY specific steps to follow (which includes the parent/guardian repeatedly going back within various time frames to the baby to comfort and soothe). Those who simply leave their child alone to scream for prolonged periods are simply not reading and being inattentive to their child’s needs. I somewhat agree with Liz. Anyone that would let a baby under the age of 6 month ‘CIO’ is crazy! But once the child has already slept through the night and is eating solids at least 3 times a day and is healthy does not need to wake to nurse 3 times a night! My daughter started waking up every 2 hrs some nights and at least twice a night for 2 months straight starting at 6.5 months old. She was already eating solids and still getting lots of breastmilk. I would have to either nurse her or rock her to sleep each time she’d wake. Often we’d end up in the spare bed so my husband could sleep and I could also try to sleep while she nursed. I was so tired, my husband was tired, and of course our daughter wasn’t getting enough sleep! I thought I would never let her cry…but we decided to read Dr. Ferber’s book and see what he suggests. It made ALOT of sense and he doesn’t advocate shutting the door and just leaving them there to cry. Some children just sleep well, others don’t. I think attachment parenting works for some, and not for others. It isn’t fair to put all children into the same category as each child and situation is different. In reply to Liz, I feel young children are called dependants because they are just that. Depandant on us as parents. Very young human children are not genetially/psychologically equipped to “self soothe”. If you fill up their cup with what they need (speedy attention and fairly constant connection, even at night) they soothe themselves when they are ready and easily move on to the next stages of development. Forcing infants into develpomental stages they are not ready for doesn’t do anyone any favours in my experience. References would have increased the legitimacy of the article exponentially. I really enjoyed it, but hesitate to “share” it because of the flak I will no doubt receive without the “science” to back it up. @Liz–maybe. I know several parents who simply shut the door and walk away. From a 6 week old. *I* think it’s criminal, but all their other friends congratulated them on getting their baby “trained” at such a young age. @Liz, the very name ‘Crying It Out’ suggests that the baby will be er, crying it out. And this will result in all of the negative outcomes as outlined above. Could you please expand on how your CIO method that doesn’t involve actually CIO works? Sounds so good its impossible to me! Baby training is cruel & irresponsible. Leaving a baby to cry for WHATEVER reason goes against all mothering instincts. There is no excuse or justification for leaving babies to cry. Delude yourself with whatever misinformation you like, but ignoring crying is abusive. Every moment with my baby is precious, why would I want to spend it ignoring her??? Think about what messages you’re sending when you leave a baby to cry…you’re not important, give up, I don’t care, my needs are more important, you’re not good enough, my love is conditional. My husband and I practiced “control crying” – which isn’t letting the baby cry while abandoned (as your article intimates) but rather re-entering in 5 minute intervals to reassure baby, check no hazards or discomfort and then re-leaving the baby for another 5 minutes to self-sooth. My kids are now 7and 10 and are healthy, balanced, etc etc. Articles like this are one more way to make vulnerable new parents feel guilty and confused. The ‘research’ that talks of a ‘gradual development of apathy’ sounds more like what happens when children are left in a cot all day in a crowded orphanage, rather than a healthy child in a loving home. This article simply tries to combat one extreme with another. I fully sympathise with the other commenters who are questioning whether they can truly be a good parent when attempting to function on incredibly limited sleep. Each to their own. I don’t dispute people’s right to practice ‘attachment parenting’ but if you go to an extreme, don’t expect me to patiently listen to you complaining of lack of sleep. We have gently helped our kids learn to sleep through the night, from around the age of six months. They are utterly undamaged by the experience, wake very well-rested (as do we as parents) and say “I love you”. That’s my own ‘research’ (2001 – 2011). Crying-In-Arms is NOT the same as CIO and is in line with Attachment Parenting. Check out Aletha Solter’s “The Aware Baby” for more info. It was a Godsend to me when my son was 6 weeks-6 months and still very helpful at times after that. Crying in the arms of a loving parent who is paying attention to the baby does not cause the same physical effects as crying all alone and, in fact, lowers stress hormone levels. I am an advocate of Attachment Parenting, but don’t practice all the aspects religiously. My husband and I need to do what works for us as a family. I don’t use Cry It Out and my almost 4 month old son sleeps in a rocking bassinet beside our bed and sleeps really well. For those people struggling with baby sleep, I have been following the routines and philosophies of TIZZIE HALL (A baby sleep expert). She does not advocate Cry It Out, she recommends you pick up your baby for a “wet cry” but not for a protest cry (no tears, just complaining). They are very different cries. She does recommend allowing your baby to “self soothe”. Anyway, find out more about her, it may help! Good luck sleep deprived parents – we’re all in this together! This article, while the basic information is good, is a bit simplistic. AP’s emphasis on the evils of CIO sometimes lead first-time parents to think that ANY crying of a child is bad. I’ve seen parents – including myself – think that we’re failing horribly if our babies cry even while we attempt to soothe them. Crying is an important way in which babies express themselves and work out their stress, so crying per se is not a bad thing, and sometimes our over-enthusiastic attempts to “soothe” a child may make the situation worse. It is important, though, as the article says, that parents be a comforting presence to a crying baby and not try to STOP a baby from crying. Another caveat is that the “no CIO” principle is a crucial one for the first six months. After that, a baby’s reasons for crying become more complex. My own son would never fall asleep if I was holding him, or if I was even in the same room with him, yet when I left he would cry. I tried to be super-AP but I only made it worse. In the end, I had to just leave him to cry. I hated to it, but it was absolutely the only way he would fall asleep. After a couple of days, he fell asleep on his own at night just fine, but he would always cry at nap time. I think it was his way of working out his tension of the day — but he was older that six months when he started doing this. So – up to six months, no CIO. After six months, things may change, and parents need to discern for themselves what will work best with their child. Personally, I`m shocked when I see people still believing in the cry-it-out methods. I find it impossible that somebody can send to their child messages such as “I don`t care about you, I don`t care if you are suffering, and my love is conditional: I love you just as long as you are quiet and don`t bother me“. OK there are methods such as “controlled crying“, which I`m still not a fan of but are better that pure CIO. But many people don`t know how to use them correctly and end up in using them as CIO. I understand what you mean: also my son needed the “pacifier“ breastfeeding to fall asleep and every time he woke up at night, and this was until 2 years! If you really feel you have to stop this because you can`t take it anymore, you probably should stop it, rather than being unhappy or too stressed. You are not letting him cry alone abandoned. If he is in your arms and you cuddle him and kiss him and make him feel loved and cared for, it`s not even comparable to the CIO method. You can keep telling him that at nigh also milk goes night-night and will be there for him the next day, but Mom is still there for him to cuddle and comfort him. He`s too little to understand now, but he is growing up fast and if you keep telling him this in a loving way he will get it. Aah. Now there are studies that back up what I knew instinctively when I became a new mother many years ago. So glad there is scientific evidence to support what most mothers have always known. Great job AP! I have a 6 month old baby boy and I have been doing the attachment method as my instincts tell me this is the way a baby should be treated. I will admit it is very hard to do but my instincts tell me this is what’s best for him. When he cries, I feel he needs to know he is safe so I make sure I am always there for him. He needs that foundation. IMO a baby or toddler is helpless and therefore by being there for them, they will learn to feel strong and confident because this is the support we gave them when they were in this helpless state. They will also IMO be linked to this 100% empathetic connection with mom, and so they will become empathetic as adults having lived this relationship with mom. Sure you will not have time to do much else, forget cleaning the house, LOL! But, if you go back in time a million years, there were no houses to clean. BTW, sleep next to your baby at night, and when he/she wakes, you breastfeed them immediately, and they go right back to sleep. I have been doing this for 6 months now and we both sleep through the entire night. TRUST your instincts! They tell you to run to your baby when he/she cries! This goes back millions of years of evolution. Pick them up and make them feel good and safe. My husband and I have two girls and we used the “baby wise” method on both of them. I don’t believe that I am an “ill informed parent”, but we did what was best for our children. Each parent will know what is best for their child and to say that every parent should follow the exact same guidelines for raising their babies into children seems like “ill informed parenting” to me. To be honest, I am so glad that we followed the baby wise program. It made for a happier for mother and happier child. My girls learned to put themselves to sleep and not rely on me to rock them and then carefully as not wake them or I’d have to keep rocking them, place them in their cribs. They got more sleep, ate better since they ate full meals and weren’t snacking and were just happier. Also, if you are aware of baby wise, it is letting them cry it out, but you just don’t leave the baby! You let them fuss for a little while, and then you go to them, let them know they are okay and then let them fuss some more. As long as you know they are fed, clean, safe and nothing else seems to be the matter, they are okay. They won’t grow up to be freaks, abuse people, afraid of relationships…they’ll be okay. I think parents who think these things need to evaluate themselves. Babies need loves and cuddles and you can do this, but I think there comes a point when they need to learn to sleep. Again, to each his/her own, and I am partial to the baby wise program, but whatever works for each parent, good for them! I have a 3-month-old daughter who was born 5 weeks early. My husband and I are practicing attachment parenting with her. I am in a recovery program that requires me to go to one hour-and-a-half meeting a week. I have attended two meetings over the course of a month and left baby with her loving and attentive father each time. Both times I have come home to screaming. My husband says both bouts lasted about 30 minutes. She stops immediately when given the breast. You don’t understand. Babies are biologically MEANT to be held and rocked to sleep by their mothers. Baby wise has led to SIDS. That’s why there is a big controversy surrounding those books. I agree that each parent should listen to their own individual child’s needs. But, just because it worked better for your adult needs and they seem okay doesn’t necessarily mean that it was the right choice for your children. I don’t understand CIO. I can’t bear to listen to my child cry especially when I know all he wants is me. I rock my son to sleep at night and it only takes FIVE to TEN minutes of my time. At 2 1/2 months he started sleeping for one 7 hour stretch and one 4-5 hour stretch at night. It’s worth those few minutes of rocking to me! Is this Baby Wise method similar to that Baby Whisperer lady’s? Sounds like that Tizzie woman is similar as well. Those are westernized method s to make it easier on parents & caregivers…it makes me soooooooo very sad. Methods have nothing on a mothers instinct, which unfortunately many mothers & caregivers seem to be lacking. Ignorance often accompanies self righteousness…makes me sick, really. Again lots of great comments.I do not ever use or would want to use cry out methods.The person who commented that if an adult was upset they would want comfort but these are children.I have resettled children by going back in many many times holding their hands, rubbing backs, stroking.sometimes this is very frequent sometimes not butnever just letting them cry.bulbys attatchment theories have been around now for a long time.they are studies that make sense and we shouldnt ignore them.I love seeing how the children I care for respond to the positive care that I give them.the cuddles I recieve makes my work so worthwhile.